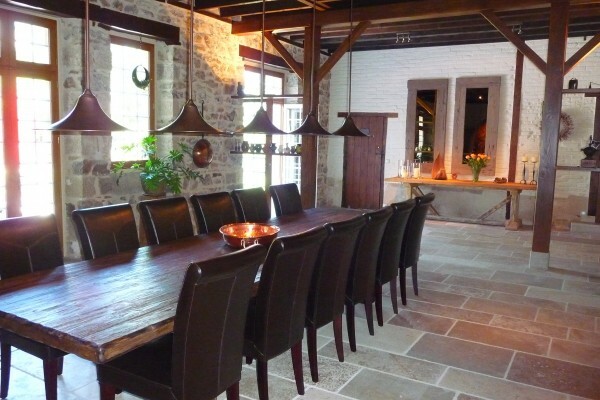 This ancient U-shaped farm, lovingly restored, is situated at the end of a country lane. 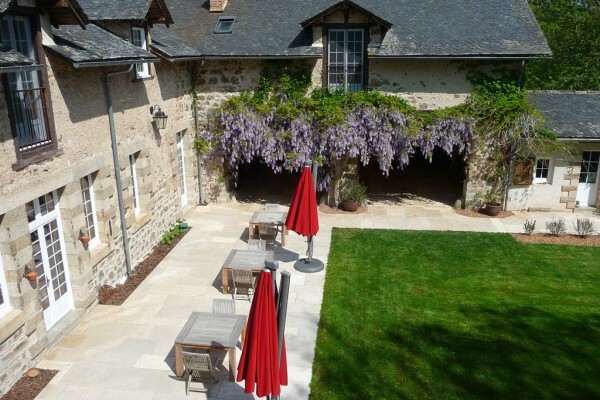 Here you will find serenity, rest and wonderful facilities set in nature of the Aveyron. Our rolling countryside of more than 8.5 acres full of oak trees, chestnuts and grasslands reaches until the river. The guestrooms, all of them on the first floor, have recently been renovated and provided with all contemporary comfort in a splendid authentic ambient. In the morning we pamper you with an excellent and copious breakfast buffet. Depending on the weather you can enjoy it either on our sun terrace in the enclosed garden, or in our spacious dining room on a cloister table. In our big heated outdoor pool you can find refreshment and a pleasant spot to laze away, to read or to sunbathe. The enclosed garden offers a beautiful view of the valley and guests can choose to have a laze in a hammock or an arm chair, or simply to walk to the river. In our well furnished library and abundant documentation you will find plenty of ideas for a day out, a hike in the superb Aveyron countryside, a cultural-historical excursion to one of the of the numerous medieval villages and boroughs, like the old Royal bastide of Villefranche de Rouergue (10 km), a visit to an antique fair or a folk market, or a culinary exploration. Sports enthusiasts have a wealth of options including biking, canoing or kayaking, golf, fishing, rock climbing, horse riding, and many others. The famous cities of art and culture in Southern France lend themselves perfectly for a daytrip: Albi (81 km), Cahors (67 km), Toulouse (140 km)… La Ferme du Roc is also a magnificent stop-over on your way to the Provence or the Côte d’Azur. 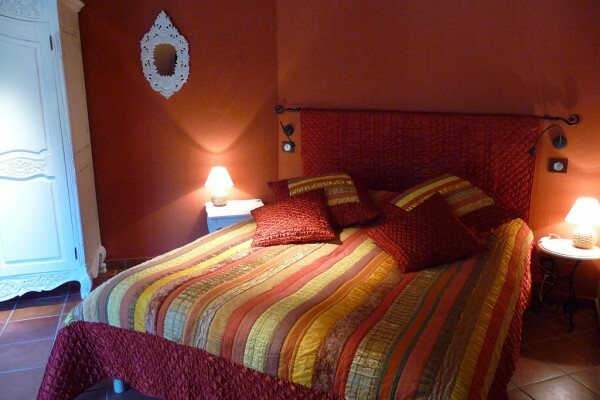 Discount : stay 3 nights or longer and save 10 € per night. Ik heb jullie gezien op TV met 4 in bed in december 2016. Prachtige zaak en nog veel succes. Jullie zijn wel moeilijk te vinden op internet. Voor ons een ideale stop wanneer we naar belgie gaan bij familie. een fantastische vakantie gehad samen met onze tienerkinderen van 13 en 16 jaar oud. door de gastvrijheid en ligging is dit veblijf top. een aanrader voor wie rust en kalmte wil en toch genieten van het mooie weer. vanuit oostkamp zo'n 910 km ver en je waant zich in een heel andere wereld. wij zijn daar tien nachten geweest en de vakantie was veel te kort voor haar. Tina en Luc waren zeer vriendelijk mensen, we waren daar zeer goed ontvangen. Tina vond niets teveel om te doen. Ge ziet dat niets teveel is voor haar. Een map lag op de kamer, waar verschillende uitstappen in stonden. Alsook eet mogelijkheden, de drie die we bezocht hebben waren uitstekend. De kamer was perfect verzorgt. 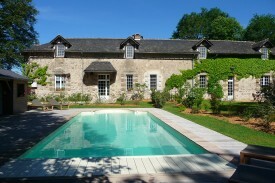 Did you stay in La Ferme du Roc? Let us know what you thought about it and help others to make the right choice! * I confirm having stayed in La Ferme du Roc. Find other bed & breakfasts in Maleville.